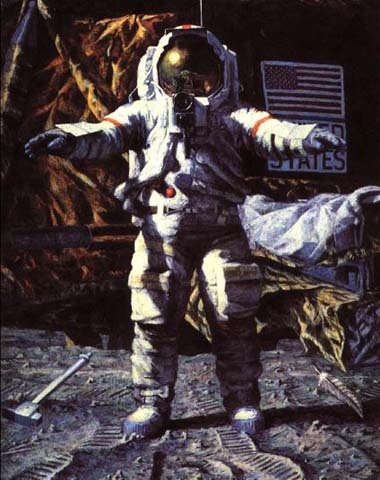 "The Hammer and the Feather" (48" x 37 1/2", Acrylic on Masonite) by Astronaut Alan Bean. Apollo 15 commander David R. Scott confirms Galileo's hypothesis that in the absense of air resistance all objects fall with the same velocity. A geologic hammer in Scott's right hand and a falcon feather in his left hand reached the surface of the moon at the same time (see chapter 13). The demonstration was performed before the television camera on the lunar roving vehicle, and no photographs were made. Acknowledgment: Special thanks to David Woods for scanning and proofreading Where No Man Has Gone Before, and formatting it for use on the World Wide Web.